Resources for creating an online presence as a UNLV Faculty member and student..
Online Reputation Management is a way for faculty to manage their scholarly identity and online presence. Even if you don't currently have any online profiles, there is likely still information about you that exists. Creating your own profiles helps you to manage information available and enables you to gather your scholarly work into one (or just a few) specific place(s). Part of this is using today's online tools to help increase the likelihood that your scholarly works from the past and present are discovered by modern researchers (increasing their discoverability). 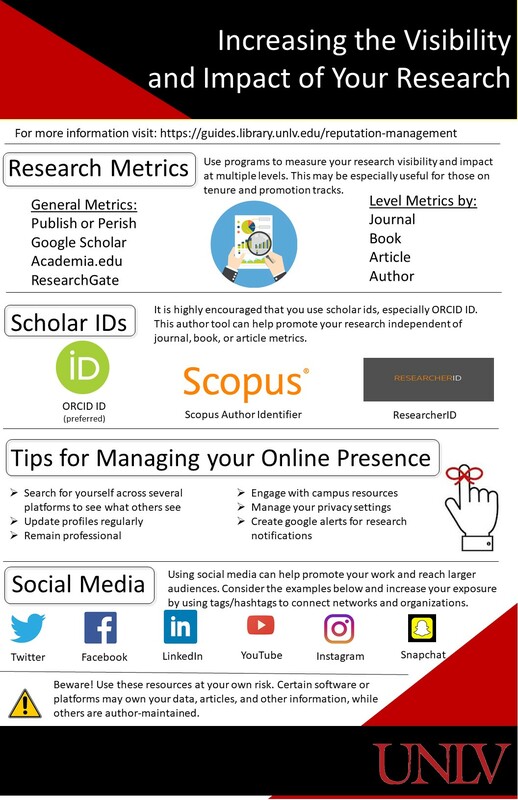 Effectively managing your online scholarly identity not only helps your works reach a wider audience, but it can also provide networking opportunities, help find potential future collaborators, and help you measure your scholarly impact. This guide has been created to help you effectively manage your online reputation, including how to create profiles on UNLV's website and other academic networking sites like ResearchGate, obtain an ORCID identification number, how to create and manage social media accounts such as Twitter, and more. This guide has content created by Christina Miskey, Citation & Bibliography Assistant and Matthew Murray, Library Fellow.